There are many examples of apparent manipulation of host phenotype by parasites, yet few examples of hypermanipulation—where a phenotype-manipulating parasite is itself manipulated by a parasite. Moreover, few studies confirm manipulation is occurring by quantifying whether the host’s changed phenotype increases parasite fitness. 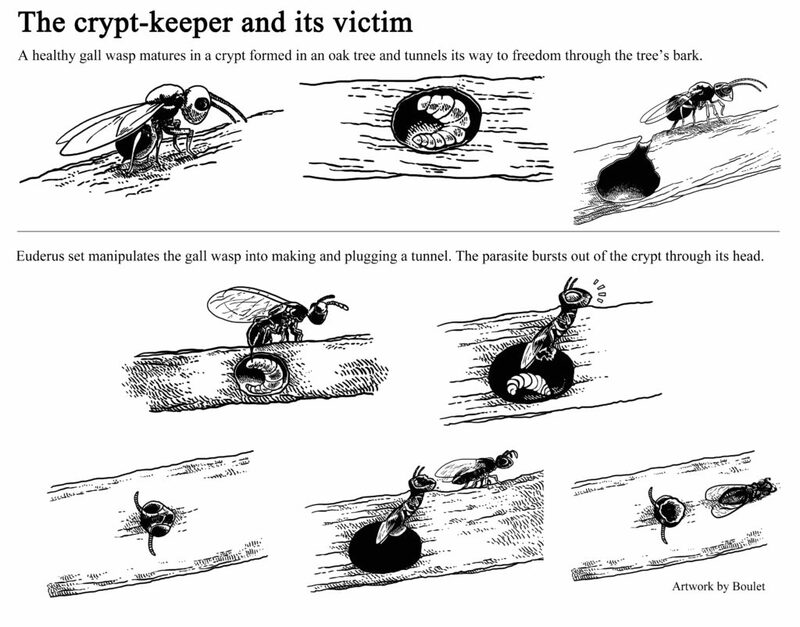 Here we describe a novel case of hypermanipulation, in which the crypt gall wasp Bassettia pallida (a phenotypic manipulator of its tree host) is manipulated by the parasitoid crypt-keeper wasp Euderus set, and show that the host’s changed behaviour increases parasitoid fitness. Bassettia pallida parasitizes sand live oaks and induces the formation of a ‘crypt’ within developing stems. When parasitized by E. set, B. pallida adults excavate an emergence hole in the crypt wall, plug the hole with their head and die. We show experimentally that this phenomenon benefits E. set, as E. set that need to excavate an emergence hole themselves are about three times more likely to die trapped in the crypt. In addition, we discuss museum and field data to explore the distribution of the crypt-keeping phenomena. 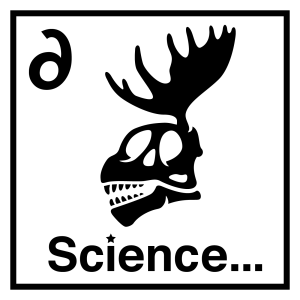 We’re looking for a postdoc! See below! Description: The position will involve taking on a 1.5 year project in the Hechinger Lab at Scripps Institution of Oceanography, University of California, San Diego. The project is part of a larger, international project. Collaborators include Dr. Øyvind Øverli (Norwegian University of Life Sciences) and Dr. Kelly Weinersmith (Rice University). The overall project weds parasitology, ecology, behavior, neurobiology, and omics. This post-doc will examine the impacts on estuarine birds by Euhaplorchis californiensis, a trematode parasite. The parasite uses birds as final hosts, but effects there are countered to unknown extent by the parasites modifying the behavior of the birds’ prey, the California killifish, making them easier to catch. The current plan is for the post-doc to be lead a laboratory study using controlled exposures of final hosts (birds, rodents) to document the parasite impacts on those hosts. Impacts will be measured at least by growth rates and, likely, metabolic rates (respirometry). The post-doc may also be involved with other aspects of the project, including a field experiment using fish in enclosures to quantify how fish infection changes bird predation rates and success. 1. Ability to handle, maintain, and dissect birds and rodents. 2. Ability to do respirometry on air breathing vertebrates. 3. Ability to dissect fish, birds, and rodents, and quantify parasite abundance and body size. 4. Have good communication, organizational, collaborative skills. 5 viagra quebec. Have solid analytical skills. At least a working knowledge of general and generalized linear models. Dynamical modelling skills are a plus, but not required. 6. Proven writing/publication skills as indicated by published papers. 7. Experience or ability to deal with live, wild estuarine birds. Appointment Length/Period: Appointment will start as early as 1 August 2016 and continue for 1.5 years. Application procedure: Send an email with subject header “POST-DOC APPLICATION”, with an attachment of a single PDF file that includes a cover letter, CV, statement of research interests, and contact information for three references to Dr. Hechinger at rhechinger@ucsd.edu. 00:00:00 – Kelly is back and she’s got an update on some scientists that seem to have found a way to stem the spread of the chytrid fungus affecting all those poor froggies. Hope on the horizon? Maybe, but it’ll be a hard technique to apply large scale. We also spend some time talking about a Civil War story involving glowing wounds the help soldiers survive. A science fair project may have found the answer, but Ryan still thinks a body farm experiment needs to be done.